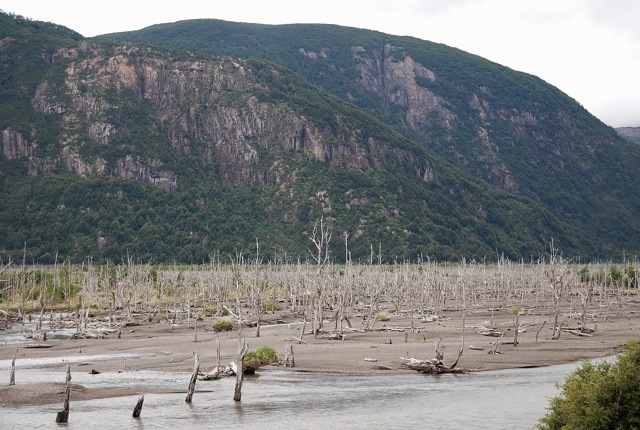 In August of 1991, barely six months after I visited the Argentine town of Los Antiguos for the first time, Chile’s nearby Volcán Hudson expelled a mass of ash and gases that left large areas of Patagonian farmland and pasture under a layer of volcanic debris. It killed thousands of sheep and cattle that were unable to reach pasture or water, and also affected the fruit crops, particularly cherries, grown in Los Antiguos and nearby Chile Chico. Even today, the effects of Hudson are visible along the southern sector of the Carretera Austral, whose Bosque Inundado (“Sunken Forest”, pictured below) is a result of the lahars (mudflows) that submerged the area’s native forests. Now the 1,905-meter Hudson is at it again. Three days ago, Sernageomin (Chile’s counterpart to the U.S. Geological Survey) issued a red alert that includes evacuation of the surrounding area, 137 km southwest of the regional capital of Coyhaique. 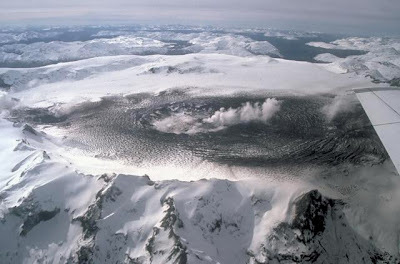 The area is only thinly populated, so loss of life is unlikely, but Hudson’s last eruption continued for nearly three months. Given the proximity of the Carretera Austral, it’s possible that this could disrupt overland travel during the upcoming tourist season. If the 1991 eruption is any precedent, it could also affect air traffic in southern Chile and Argentina, which has already had to work around the eruption of the Puyehue-Cordón Caulle volcano, which began last June 4 and has not completely ceased. From Buenos Aires, my friend Nicolás Kugler writes that “It is easy to notice even here that the usual post-pampero pristine blue sky is not as clean as it is used to be before the Puyehue eruption. And ashes on the balcony and on most cars are a common sight now.” The pampero is a southerly wind that usually brings cool, clear weather to Buenos Aires and northern Argentina. At least Volcán Chaitén, in northernmost Chilean Patagonia, has settled down since its 2008 eruption and, though I personally wouldn’t invest in property so close to a caldera that’s blown so recently, people are moving back into the area. Still, Chile’s volcanoes bear watching for anybody bound south this coming summer. Continuing this afternoon, my promotion tour for the new third edition of Moon Handbooks Patagonia will feature a series of digital slide presentations on southernmost South America. 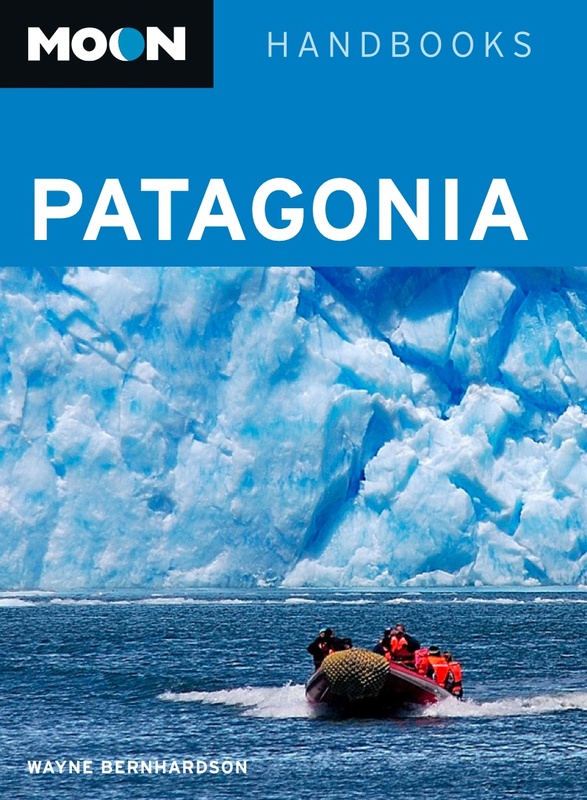 In addition to covering the capitals of Buenos Aires and Santiago, the gateway cities to Patagonia, I will offer a visual tour of the Chilean and Argentine lakes districts, Argentina's wildlife-rich coastline and Chile's forested fjords, the magnificent Andean peaks of the Fitz Roy range and Torres del Paine, and the uttermost part of the Earth in Tierra del Fuego. I will also include the Falkland Islands, with their abundant sub-Antarctic wildlife. Today, at 2 p.m., I will speak at the San Mateo County Library, 1110 Alameda de las Pulgas, Belmont, CA 94002, tel. 650/591-8286.